Hiroshi Agasa (阿笠 博士 Agasa Hiroshi), most commonly referred to as Professor Agasa (阿笠博士 Agasa-hakase), and known in the Funimation dub as Hershel Agasa, is a character in the manga and anime franchise Detective Conan. Agasa is Shinichi Kudo's next door neighbor and family friend. The first person to learn that Conan Edogawa is actually Shinichi, he invented all of Conan's special gadgets as well as the Detective Boys' badges and flashlight-watches. Sonoko Suzuki (鈴木 園子 Suzuki Sonoko), known in the Funimation English dub as Serena Sebastian, is a character from the manga and anime Detective Conan. Sonoko is Ran Mouri's best friend and is the girlfriend of Makoto Kyogoku, with whom she currently is in a long-distance relationship. Conan Edogawa sometimes has to knock her out with his stun gun watch to use her as his mouthpiece. Because of this, Sonoko has claimed to be a great high school detective in her own right, "Deduction Queen Sonoko". 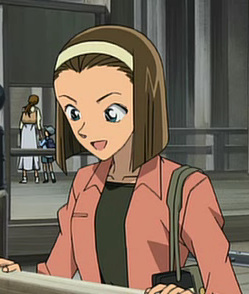 Sonoko is the daughter of Tomoko and Shiro Suzuki, heads of the extremely wealthy family and large company. Sonoko has an older sister, Ayako, and an uncle named Jirokichi, who is often involved in trying to capture the Kaitou Kid. Sonoko and Ran have been close friends since before Junior High School. Heiji Hattori (服部 平次 Hattori Heiji), also known as Harley Hartwell in the Funimation dub, is an Osakan high school detective in the manga and anime series Detective Conan. He is a childhood friend and the romantic interest of Kazuha Toyama. 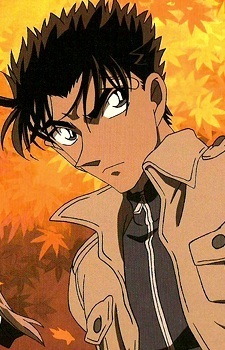 Originally a rival to Shinichi Kudo, Heiji has since found out Conan's true identity and the two often team up to work on cases. He was the first person to find out Conan's true identity himself. Heiji is a high school detective, and the son of Heizo Hattori, chief of the Osaka Police Department, and his wife Shizuka Hattori. Heiji wants to be a detective like his father, and he is also very skilled in kendo and has become a favored tournament contender for his school. Kazuha Toyama (遠山 和葉 Tōyama Kazuha? 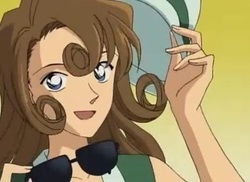 ), also known as Kirsten Thomas in the Funimation dub, is character in the manga and anime Detective Conan. 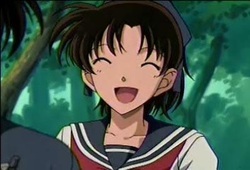 She is a childhood friend and the romantic interest of Heiji Hattori. Kazuha and Heiji Hattori have been close friends since childhood. Their fathers work together at the Osaka Police station, where Kazuha's father, Ginshiro Toyama is a subordinate and close friend of Heiji's father, Police Chief Heizo Hattori. Her mother is mentioned in episode 573, where she wanted Heiji to bring Kazuha her drinkbottle. Yukiko Kudo (工藤 有希子 Kudō Yukiko?) 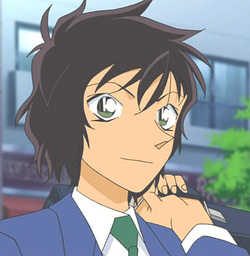 is the mother of Shinichi Kudo and, along with her husband Yusaku, one of few characters who knows he is Conan Edogawa. She was once a famous actress, but retired after marrying Yusaku. She was also close friends with fellow actress, Sharon Vineyard, both being excellent masters of disguise. 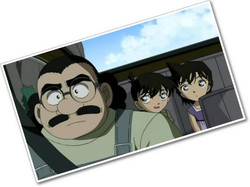 Yusaku Kudo (工藤 優作 Kudō Yūsaku) is the father of Shinichi Kudo and, along with his wife Yukiko, is one of only a few characters to know he is Conan Edogawa. He is also a world famous novelist and the creator of the popular Night Baron series. Subaru Okiya (沖矢 昴 Okiya Subaru) is said to be an engineering student who currently resides in Shinichi Kudo's house next to Professor Agasa. It was strongly hinted that he is the Black Organization member Bourbon; however, it has been revealed that the identity of Bourbon is, in fact, Tooru Amuro. 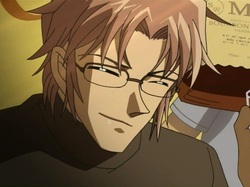 Another popular theory is that Okiya is Shuichi Akai disguised after faking his death with Hidemi Hondou's help and this seems to be proven true when Okiya opens one of his eyes to reveal what looks like Akai's eye. Subaru Okiya is a graduate student attending Tohto University to earn a doctorate degree in engineering. He originally lived at a boarding house, where the landlord's son nicknamed him "Red Man," after a firetruck, because he frequently saw him watering the plants. After the boarding house burned down in the Red, White, and Yellow Arson Case, Conan suggested he move into Shinichi's house, explaining to Agasa and Haibara that someone living in the house would help to hide his (Shinichi's) disappearance. When Haibara protested, Conan cheerfully responded that someone who loves Sherlock Holmes cannot be a bad person - much to Haibara's consternation. Nevertheless, Conan decided to keep from Subaru which persons - specifically Ran - were closely connected to Shinichi. 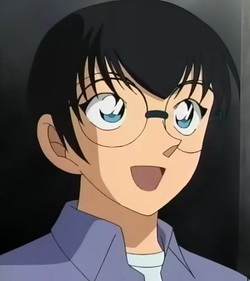 Masumi Sera (世良 真純 Sera Masumi) is a character in the manga and anime franchise Detective Conan. She is a self-proclaimed high school detective and practitioner of the martial art Jeet Kune Do. After making a mostly correct deduction during a murder case, she transfers to Ran's high school class. She seems to know that Conan is a detective. Masumi Sera is a high school detective and skilled at Jeet Kune Do, the martial art founded by Bruce Lee. She can fight in the same level as Ran. She transfers to Ran and Sonoko's class at Teitan High. Since three years ago, she'd been living in America with her parents, presumably due to Akai infiltrating the Black Organization. She claims she'd rather live in Japan where she was born and raised, so she came to Tokyo and is currently living in a hotel.